Grilling burgers is a traditional backyard pastime for family dinners and get-togethers with friends. However, improper handling or cooking can lead to sickness from potential harmful bacteria in the meat. When ground beef is manufactured, it can be exposed to harmful bacteria. In fact, it may be that 0.1 to 1 percent of commercial ground hamburger contains enough E. coli -- bacteria that can cause illness -- to make a child sick. 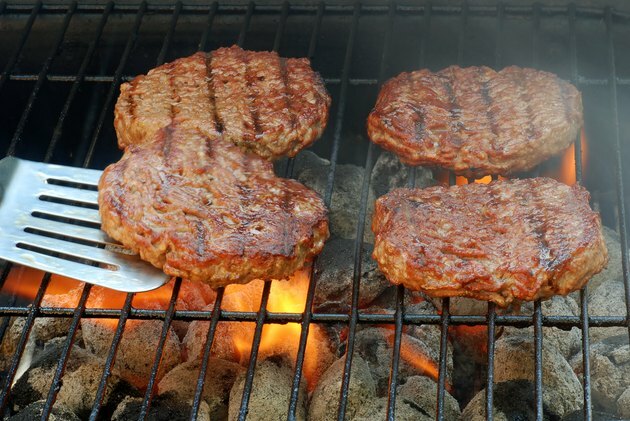 To destroy all of the bacteria, you must grill the burgers to a specific internal temperature. Wash your hands, counter tops and cooking utensils with soap and warm water before preparing burgers. Set the grill on medium to high and allow it to reach 400 degrees Fahrenheit. Form the meat into patties ranging from 1/2- to 1-inch thick. Cook and flip the burgers. Cooking times vary based on the thickness of the burgers, temperature of the meat and grill temperature. For example, a 4-oz. burger takes about 5 minutes per side, while an 8-oz. burger takes about 14 minutes per side. Check that the internal temperature of the burgers reaches a minimum of 160 F for at least 15 seconds, making sure the thermometer probe is in the center of the burger. Don't predict the temperature based on color. The color of beef can change based its pH level. The U.S. Department of Agriculture recommends thawing ground beef in the refrigerator and using within 1 to 2 days. Cooking ground beef that is completely thawed allows the burgers to reach the optimal internal temperature. Never leave raw ground meat sit out unrefrigerated for more than 2 hours.